This lentil soup is flavored subtly with cinnamon, bay and thyme. I almost didn’t try it except for I was in a bit of a mood for something different – and I’m so glad I did. On a cautionary note, do not serve this without a dab of yogurt or sour cream. It really isn’t optional and makes the soup, truly. Even with the dab of dairy, this soup is perfect in the days following a bit of overindulgence during the holidays. Brimming with vegetables and low in fat, it’s a great use of Left over Ham and is one of the recipes featured in my post on the Twelve Days of Ham. Saute onions, carrots and celery until nicely browned and caramelized. The teaspoon of sugar, added after the vegetables have softened, is added to aid with the browning. This process will take about 20 minutes or so. Just use a good stock and add a bit of ham to the soup. Simply caramelize the vegetables and when done, add stock (or a combo of stock & water) & seasonings, ham and lentils and simmer until lentils are done, about 30 minutes. Ham hock: Start the ham hock in the broth while caramelizing the vegetables. After the hock has been simmering about an hour or so and is nearly tender, add the lentils and seasoning and cook until lentils are tender about 30 minutes. Remove ham hock and shred, adding meat back to soup. Ham bone & broth: A whole ham bone & resulting broth is just too much for this soup. Make the broth following the recipe on my Cuban Black Bean Soup recipe, and use 11 1/2 cups of the broth and part of the meat for this recipe. 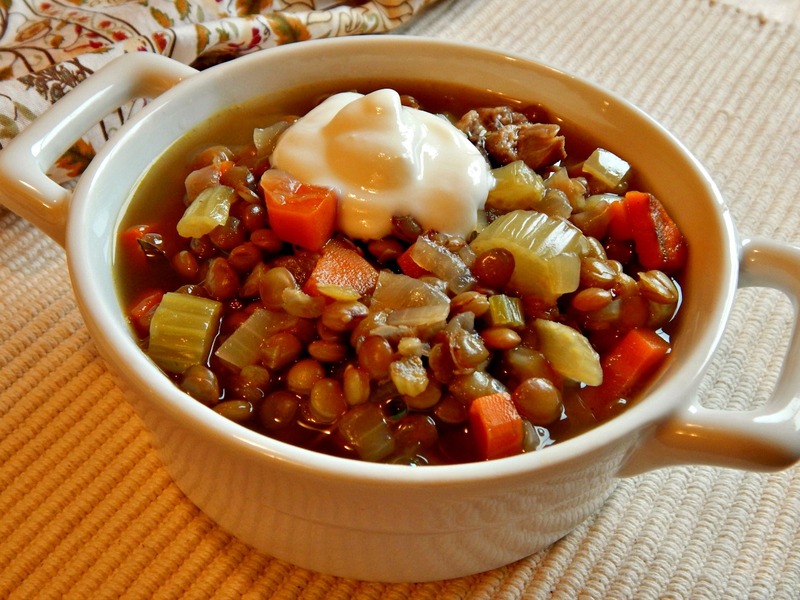 Caramelize the vegetables, add the ham, broth and seasonings with the lentils and cook until lentils are tender. Before serving: Discard bay leaf and cinnamon. Remove bone and chop meat; stir into soup. Taste for salt and pepper. It will likely need a good amount of pepper and possibly more salt. The use of a cinnamon stick can be a huge variable, depending on how large, how fresh or how strong. I often test by “scent.” When I smell the cinnamon, I remove the cinnamon stick. If the broth is not of a good, strong flavor, or there is not enough salt, this soup will very likely fall flat. If necessary, supplement with a bit of bullion or base. If ham hock isn’t smoked, or if you’d like, add a few drops of liquid smoke to the soup. Per Serving: 365 Calories; 5g Fat (11.1% calories from fat); 27g Protein; 55g Carbohydrate; 27g Dietary Fiber; 19mg Cholesterol; 1317mg Sodium. Exchanges: 3 Grain(Starch); 2 1/2 Lean Meat; 1 1/2 Vegetable; 0 Non-Fat Milk; 1/2 Fat; 0 Other Carbohydrates. This Lentil and Ham soup would certainly be easy to turn into a vegetarian soup. If you came to this recipe looking for a way to use your leftover holiday ham, be sure to check out the link below for 12 Days of Ham. You might want to see the sister post for 12 Days of Turkey, too. This entry was posted in Click here for Bargain Meals, Click here for Fabulous Food Posts and tagged Freezes Well, Ham, Ham Stock, leftover ham, Lentil, Lentil Ham Soup, Soup, Sour cream, Yogurt. Bookmark the permalink.